Simply Safe® maintains this Internet site to assist their customers. This is a service which is continually under development. While we try to keep the information current and accurate, we can make no guarantees. Please inform us of any difficulties you experience with the site. Whenever, possible, we will correct them. All content available at this site, such as text, graphics, logos, button icons, images, and/or other content, including any documents you may download or otherwise access in connection with this site (collectively “Content”), is the property of Simply Safe® and is protected by U.S. and international copyright laws, including the compilation (meaning the collection, arrangement, and assembly) of all such Content. Simply Safe® reserves the right to remove all Content, from whatever source, at any time, for any reason (including, but not limited to, claims or allegations made by third parties relating to such Content), or for no reason at all. The Content may be used only for non-commercial purposes. Any other use, unless otherwise authorized in writing by Simply Safe®, including the framing, linking to, reproduction, modification, distribution, transmission, republication, display, or performance, of the content on this site is strictly prohibited. © Simply Safe Products, LLC. 2011 All Rights Reserved. “Simply Safe®”, and other Simply Safe® graphics, logos, and service names are trademarks or service marks of Simply Safe®. Simply Safe® trademarks may not be used in connection with any product or service that is not Simply Safe®, in any manner that is likely to cause confusion among customers, or in any manner that disparages or discredits Simply Safe®. Except as expressly and unambiguously provided herein, Simply Safe® does not grant you any express or implied rights under any patents, copyrights, trademarks, trade secret, or other intellectual or industrial property rights. This site or any portion of this site may not be reproduced, duplicated, copied, sold, resold, or otherwise exploited for any commercial purpose that is not expressly permitted in a writing signed by Simply Safe®. Simply Safe® reserves the right to refuse service, terminate accounts, and/or cancel orders in its discretion, including, without limitation, if Simply Safe® believes that customer conduct violates applicable law or is harmful to the interests of. THIS SITE IS PROVIDED BY Simply Safe® ON AN “AS IS” BASIS. Simply Safe® MAKES NO REPRESENTATIONS OR WARRANTIES OF ANY KIND, EXPRESS OR IMPLIED, AS TO THE OPERATION OF THE SITE OR THE INFORMATION, CONTENT, MATERIALS, OR DOCUMENTS INCLUDED ON THIS SITE. TO THE FULL EXTENT PERMISSIBLE BY APPLICABLE LAW, Simply Safe® DISCLAIMS ALL WARRANTIES, EXPRESS OR IMPLIED, INCLUDING, BUT NOT LIMITED TO, IMPLIED WARRANTIES OF MERCHANTABILITY AND FITNESS FOR A PARTICULAR PURPOSE AND NON-INFRINGEMENT. Simply Safe® FURTHER DOES NOT WARRANT THE ACCURACY OR COMPLETENESS OF THE INFORMATION, TEXT, GRAPHICS, LINKS OR OTHER ITEMS CONTAINED WITHIN THIS SITE. SOME STATES DO NOT ALLOW LIMITATIONS ON THE DURATION OF AN IMPLIED WARRANTY, SO THE ABOVE LIMITATIONS MAY NOT APPLY TO YOU. Simply Safe® WILL NOT BE LIABLE UNDER ANY THEORY OF LAW, FOR ANY INDIRECT, INCIDENTAL, PUNITIVE, OR CONSEQUENTIAL DAMAGES, INCLUDING, BUT NOT LIMITED TO INJURY, LOSS OF PROFITS, BUSINESS INTERRUPTION, LOSS OF INFORMATION OR DATA. SOME STATES DO NOT ALLOW THE EXCLUSION OR LIMITATION OF INCIDENTAL OR CONSEQUENTIAL DAMAGES, SO THE ABOVE LIMITATIONS AND EXCLUSIONS MAY NOT APPLY TO YOU. Simply Safe® may make changes to the Content, services, or the products provided by Simply Safe® at any time without notice. Simply Safe® makes no commitment to update Content, services or products. Simply Safe® reserves the right to make changes to its Web site and these notices and disclaimers at any time. Your access or use of the website, Content, or services subsequent to such a change will signify your asset to be bound by such changes. This site is created and controlled by Simply Safe® in the State of Wisconsin, USA. As such, the laws of the State of Wisconsin will govern these disclaimers, terms, and conditions, without giving effect to any principles of conflicts of laws. Simply Safe® management and personnel respect the copyright and intellectual property rights of others. Our users are expected to respect those rights as well. Unauthorized copying, distribution, modification, public display, or public performance of copyrighted works is an infringement of the copyright holders rights. As a condition to your use of the Simply Safe® site, you agree that you will not use the site in connection with the infringement of the intellectual property rights of others in any way. Simply Safe® may remove Content that appears or is alleged to infringe the copyright or other intellectual property rights of others. In addition, you acknowledge and agree that Simply Safe® may terminate the use of the site by users who appear or are alleged to infringe the copyright or other intellectual property rights of others or if Simply Safe® believes that user conduct is harmful to the interests of Simply Safe® or other users. Simply Safe® has adopted the following procedure in accordance with the Digital Millennium Copyright Act or DMCA (posted at www.lcweb.loc.gov/copyright/legislation/dmca.pdf). If you believe that material or content accessible on or through the Simply Safe® website infringes a copyright, please send a notice containing the following information to the designated agent listed below. 6. A physical or electronic signature of a person authorized to act on behalf of the owner of the copyright that has been allegedly infringed. Upon receipt of such notice, it is Simply Safe® policy to remove or disable access to the allegedly infringing material and to notify the user that it has done so. If the user believes that such material is not infringing or that it has the right to post and use such material, the user must send a counter-notice containing the following information to the designated agent listed below. 4. The users name, address, telephone number, and, if available, e-mail address and a statement that such person or entity consents to the jurisdiction of the Federal Court for the judicial district in which the users address is located, or if the users address is located outside the United States, for any judicial district in which Simply Safe® is located, and that such person or entity will accept service of process from the person who provided notification of the alleged infringement. Simply Safe® may send a copy of the counter-notice to the original complaining party and inform that person that it may replace the removed material or cease disabling it in 10 business days. Unless the copyright owner files an action seeking a court order against the user, the removed material may be replaced or access to it restored in 10 to 14 business days after receipt of the counter-notice, at Simply Safe® discretion. COPYRIGHT NOTICE: Copyright © 2000-2011 Simply Safe Products, LLC , All Rights Reserved. Use, duplication, or disclosure by the United States Government is subject to the restrictions set forth in DFARS 252.227-7013(c)(1)(ii) and FAR 52.227-19. (a) Simply Safe Products, LLC warrants to the buyer that its products shall be free from defects in material and workmanship under normal use for a period of thirty (30) days after the date of delivery. All claims for errors, defects or damage to products or any part thereof must be made by the buyer within thirty (30) days after the date of delivery. Failure to make any such claim within that time shall be deemed to constitute an irrevocable acceptance of the products as though the products had been delivered free of any such errors, defects or damage. The obligation of Simply Safe® under the foregoing warranty shall be limited to either (i) replacing, F.O.B. Simply Safe®’s warehouse in Thiensville, Wisconsin, USA, or (ii) allowing a purchase credit, at Simply Safe®’s option, for, any products which may prove to be damaged, defective or unsuitable, provided the buyer (A) gives Simply Safe® prompt notice of the errors, defects or damage and returns the products to Simply Safe® with shipping charges prepaid within the thirty (30) day warranty period, and (B) an inspection by Simply Safe® confirms the alleged errors, defects or damage to the products. (b) The foregoing remedy of replacement or purchase credit, at Simply Safe®’s option, is buyer’s sole and exclusive remedy for any errors, defects or damage to any Simply Safe® products. 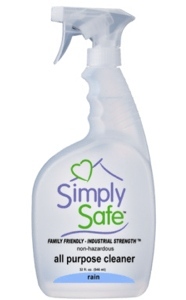 Simply Safe® will not be liable for any special, direct, indirect, incidental or consequential damages of any kind whatsoever (including, without limitation, lost profits), whether based upon warranty, contract, negligence or strict liability arising in connection with the sale or use of Simply Safe® products. Simply Safe®’s maximum liability shall not in any case exceed the price for the products claimed to be damaged, defective or unsuitable and shall not extend to any products for which buyer has not fully paid Simply Safe®. Simply Safe® disclaims any liability against infringement of any patent or trademark through buyer’s use of any product or process in combination with other materials or processes. (c) Simply Safe® does not guarantee end-use results for any of its products. It is the buyer’s ultimate responsibility to determine the usefulness and applicability of an Simply Safe® product for the buyer’s specific application. EXCEPT FOR THE WARRANTIES SET FORTH ABOVE, Simply Safe® MAKES NO REPRESENTATIONS OR WARRANTIES OF ANY KIND WHATSOEVER, EXPRESSED OR IMPLIED, INCLUDING, WITHOUT LIMITATION, WARRANTIES OF MERCHANTABILITY AND FITNESS FOR A PARTICULAR PURPOSE, CONCERNING ANY PRODUCT. ALL GUARANTEES, WARRANTIES, CONDITIONS AND REPRESENTATIONS, WHETHER EXPRESS OR IMPLIED, ARISING OUT OF ANY STATUTE, LAW, COMMERCIAL USAGE OR OTHERWISE, ARE HEREBY EXCLUDED. WHILE Simply Safe® MAY, FROM TIME TO TIME, OFFER RECOMMENDATIONS AND ADVICE WITH RESPECT TO THE USE OF ITS PRODUCTS, IT IS UNDERSTOOD AND AGREED BY BUYER THAT ANY SUCH RECOMMENDATIONS AND ADVICE ARE NOT WARRANTIES BY Simply Safe® AND BUYER WILL ACT UPON ANY SUCH RECOMMENDATIONS AND ADVICE AT BUYER’S SOLE RISK. (d) Online purchase of Simply Safe® products constitutes buyer’s express acknowledgment of and acceptance of the foregoing limited warranties, disclaimers of warranties and limitations of liability.